Back from the Brink: Is the Tassie Tiger alive and kicking? 19 Sep Back from the Brink: Is the Tassie Tiger alive and kicking? Image: Sightings and rumours that the Thylacine is still alive have fueled several volunteer groups to actively look for signs of the marsupial. 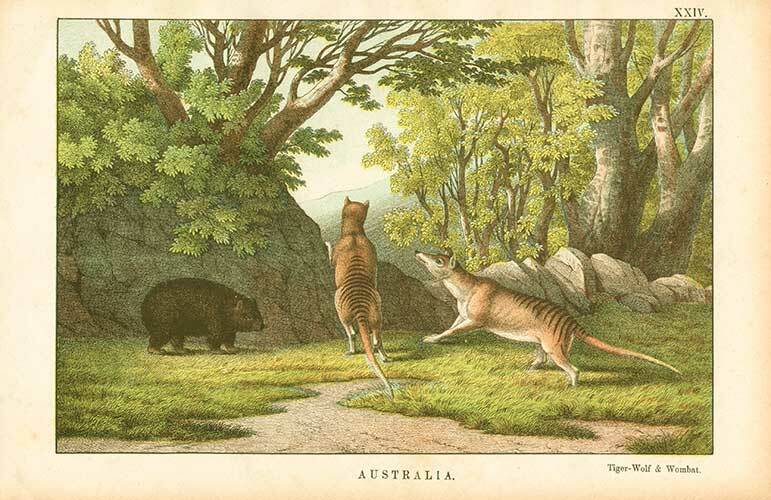 Wombat and Thylacine Lithograph, by an unknown author from the Instructive Picture Book (1877) available through a public domain license. Recently released footage of what appears to be a Thylacine has renewed speculation that the Tasmanian Tiger has escaped extinction. A Thylacine tracking group – The Booth Richardson Tiger Team (BRTT) – has released a video that purportedly includes footage and audio of the carnivorous mammal. While the group is seeking independent verification that the animal is a Thylacine, one expert has already cast his doubt. Conservationist Nick Mooney, who analysed the video, says the animal is more likely to be a spotted quoll. ‘I think based on anatomy, movement, behaviour size, I think it is perhaps a one-in-five chance it’s a thylacine’ he said. While he’s hopeful that the animal could still be alive, he is cautious about the effect a confirmed siting could have. ‘Half of Tasmania would think it was like finding oil, and the other half would probably be horrified to think what it would mean to the animals. Essentially it would be very exciting. But it’s just one piece of evidence’. In July this year, Yorke Peninsula school teacher Paul Day claimed he had filmed a Tasmanian Tiger running across a paddock at Moonta. Although commonly associated with Tasmania, there is strong evidence to suggest that Thylacines once lived across mainland Australia, and even in Papua New Guinea. Rock art including images of the Tasmanian Tiger has been found in the Northern Territory and Western Australia, and Thylacine bones have been discovered around the country – with some having been dated as more than 2,200 years old. The demise of the mainland Thylacine pre-dates European settlement, with experts suggesting that competition for food and the threat of other predators caused their extinction. Thylacines continued to thrive in parts of Tasmania until European settlers brought sheep to graze on the apple isle. By 1930, the Van Diemen’s Land Company offered a bounty for the scalp of each animal effectively sealing the fate of the species. The last known Tasmanian Tiger, Benjamin, was captured in 1933 and kept at Hobart Zoo, where he died in 1936 – supposedly from exposure after a zoo keeper forgot to lock him in an enclosure overnight. Tiger Future: Science Fact or Science Fiction? Since 1999, The Australian Museum has been leading a project to see if it is possible to bring extinct species back to life. Thylacine genes were successfully artificially duplicated in 2002. Theoretically, if enough chromosomes can be replicated, they could be transferred into the egg of a Tasmanian Devil – the only living close relative of the Thylacine – which could give birth to a live, young Tasmanian Tiger.